President Thomas S. Monson dedicates the Marriott School’s new 76,000-square-foot addition. Joining President Monson and BYU President Cecil O. Samuelson were Presidents Henry B. Eyring and Dieter F. Uchtdorf of the First Presidency, several members of the Quorum of the Twelve, and other General Authorities and members of the Board of Trustees. President Thomas S. Monson speaks at the dedication of the Tanner expansion as members of the First Presidency look on.Designed by the same architectural firm that built the original Tanner Building, the $43 million project was funded by donations. 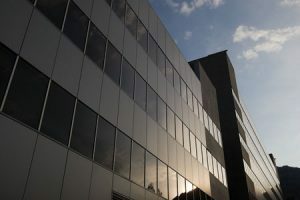 The 76,000-square-foot, four-story addition houses 39 group study rooms, 10 classrooms with tiered seating, a computer-equipped networking lab for information systems students, and one large, divisible assembly hall. A New York-style deli and a three-story parking structure were also added. 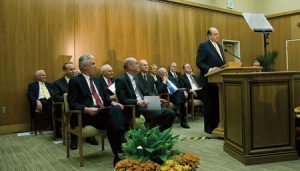 President Thomas S. Monson speaks at the dedication of the Tanner expansion as members of the First Presidency look on. Some 4,000 tech companies have made a home on Utah’s Silicon Slopes, thanks in no small part to BYU. Why do so many well-intentioned service efforts fall short? BYU experts offer ideas on how to make a real difference.